URBANA, Ill. - With so much information flying around about fat, it is easy to be confused. Grocery aisles are stocked with reduced-fat, low-fat, and fat-free foods. Restaurant and fast-food menus are loading up on bacon and butter. Fat, fat, fat! Some people become so frustrated that they want to exclude fats all together, said a University of Illinois Extension nutrition and wellness educator. Banks explained that good fats are essential to good health. In fact, our bodies need fat and cannot live without it. Fats are an important part of a healthy diet and assist many bodily functions. They are called essential fats because our bodies cannot make them. Additionally, fats provide fat-soluble vitamins, which are needed for healthy skin, and energy. Knowing which fat does what can help you choose healthier foods. “The best fats for cooking and eating are liquid fats at room temperature. They pour rather than being scooped out of the container. These fats, called mono-unsaturated and polyunsaturated fats, come from olives, nuts, seeds, soybeans, and other vegetables. Canola oil is also in this group. These fats are considered healthy because they are good for your heart, your cholesterol levels, and overall health. They actually help lower LDL (bad) cholesterol levels,” she said. According to the National Institutes of Health, bad fats are called saturated fats and trans fats. These fats are generally solid at room temperature and only become liquid when heated. Notice how meat fat and bacon fat hardens as it cools. Too much of this fat are bad for you. Moderation is the key. Banks said that trans fats, or vegetable shortenings, are man-made. They are oils that have been hardened in an industrial process that adds hydrogen, thus the name “partially hydrogenated.” They are harmful because they lower good HDL and raise bad LDL cholesterol. Higher LDL levels can put you at risk for a heart attack from a sudden blood clot in an artery narrowed by plaque buildup, also called atherosclerosis. 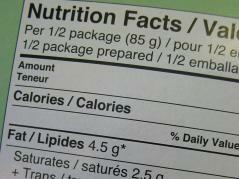 “Try to get into the habit of checking the ingredient list on food packages,” Banks advised. “These labels will tell you what’s in the food—including the type of fat and any added nutrients, or sugars. Ingredients are listed in descending order of amount by weight.